Medhat Shafik was born in Egypt in 1956. He has lived and worked in lta|y since 1976. After graduating in painting and stage design from the Brera school of art, from the 1980s he began to take part successfully in various national and international exhibitions. His breakthrough carne in 1995 when the Egyptian pavilion at that year's Venice Biennale, which was presenting his work, was awarded the Leone d'Oro alle Nazioni prize. From 1995 onwards his presence in public and private spaces, both in Italy and abroad, increased: in the Palazzo Ducale, Mantua; the museum of the Republic of San Marino; and a monumental work, Qanat, le rotte del cielo, for the Orestiadi in Ghibellina. In 1998 he took part in the international show Mediterranea in the Hotel de Ville, Brussels; Le Mans, France, devoted a solo show to him in its cultural centre L'Espal, with a catalogue introduction by Pierre Restany. Again in 1998 his video Il percorso dell'asceta was seen at the VI international film festival in the Pompidou centre in Paris. In 1999 he created his first installation La via della seta in the deconsecrated church of San Francesco, Como, curated by Alberto Fiz and Elena Pontiggia; the Galleria Blu, Milan, presented a solo show of his works at that year's Basel art fair, and his installation II risveglio della Fenice: Fuoco was shown in the Galleria Comunale, Cervia, curated by Claudio Ceritelli. In 2001 he exhibited in the contemporary art gallery in Bad Homberg, Germany, the Galleria Civica d'Arte Moderna in Spoleto, and in the Arengaria, Milan. In 2002 he began a new series of works called Sabbie, presented by Marco Meneguzzo both in Pietrasanta and in Milan, and he participated in Glass Way-le stanze del vetro dall'archeologia ai giorni nostri, an exhibition curated by Maurizio Sciaccaluga in the Museo Archeologico in Aosta. In 2003 he held a solo show in the Accademia di Belle Arti in Brescia and also took part in the Cairo international biennale where he won The Nile Grand Prize. In 2004 the installation La dimora del poeta was exhibited in the Palazzo Forti gallery and then acquired for its permanent collection. In the same year he also took part in Medioevo prossimo venturo, curated by Maurizio Sciaccaluga in Palazzo Pretorio, Certaldo. In 2005 he took part on the group show Identità e nomadismo curated by Lorezo Fusi and Marco Pierini in the Palazzo delle Papesse, Siena. In 2006 his solo show Aiqunat - territori dell'anima was seen in the Spirale Arte gallery in Milan. He also took part in the X international Cairo biennale with his video Flashback and at the same time, in the international show curated by Antonio D'Avossa in the Taranto Arsenale called Mediterraneo Contemporaneo. In 2007 he exhibited in the II Settimo Splendore in Verona, curated by Giorgio Cortenova, a show which inaugurated the renovated Palazzo della Ragione; in the same year, in the Galleria d'Arte Moderna, Genoa, he participated in the international exhibition Linee all'orizzonte, curated by M. Sciaccaluga. In September he also held a solo show, Luogo di frontiera, in Rocca di Umbertine, and, in the Palazzo della Penna, Perugina, once again in the Umbria region, he took part in the international show, curated by Luca Beatrice, Anatomia dell'irrequietezza. In November his solo show, Le città invisibili, is to be held in the Palazzo Forti modem art gallery in Verona. 'Untitled', from the series 'Porte del Paradiso', 2007 mixed media. 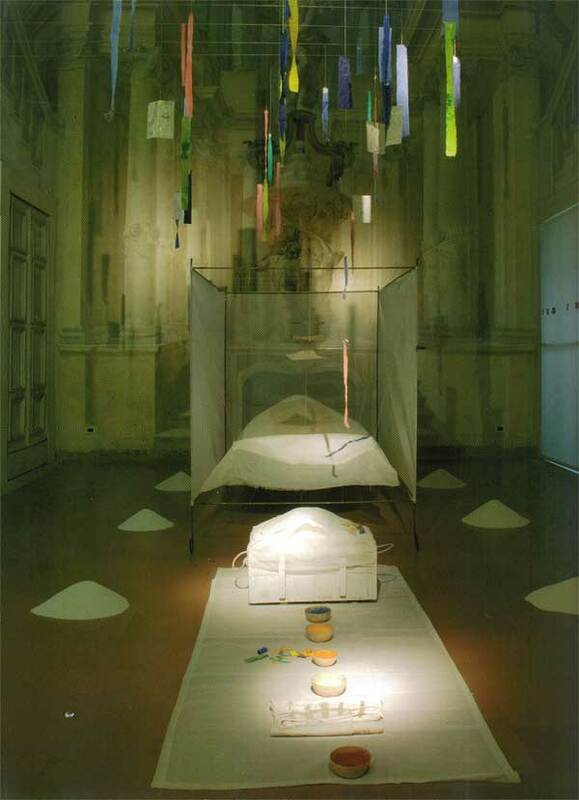 'La Dimora del Poeta' - 2003 - Installation Galleria d'Arte Moderna, Palazzo Forti - Verona.